Opened 1851 by Baptists, operated by individuals after 1857. Franklin P. Hobgood, president, 1880-1924. School closed 1925. Campus was 2 blocks S.
Oxford Female College was established in 1850 as a Baptist academy with Samuel Wait, minister and educator, serving as president. Wait is best known as the first president of Wake Forest College, serving there from 1834 to 1845. Due to financial difficulties, the Baptist Church sold the school to John H. Mills, later founder of the Oxford Orphanage in 1857. 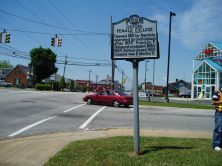 Mills was able to keep the college open during the Civil War, but sold it soon after due to low enrollment and rising debts. 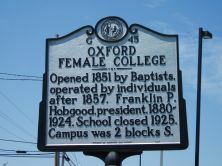 Oxford Female College was operated by several different administrators until Franklin P. Hobgood became president in 1880. Hobgood initiated extensive changes including a new name, Oxford Female Seminary, and an overhaul of the curriculum. “Preparatory” and “collegiate” courses were supported by physical activities that encouraged “gracefulness of bearing and movement.” Students wore uniforms and attended daily chapel services. When a fire destroyed the campus in 1904, citizens of Granville County raised money to rebuild the institution “on a larger and more enduring basis.” However, Oxford Female Seminary was not able to endure without Hobgood, closing its doors the year after his death in 1924. Oxford Female College, illustration from Charles Lee Smith, The History of Education in North Carolina.